The Dev Series collection by Manjaz appears in a new interpretation. A 133-piece limited edition to mark the corresponding anniversary of the Solothurn-based brand shows itself entirely in tune with its time while revisiting historical codes. 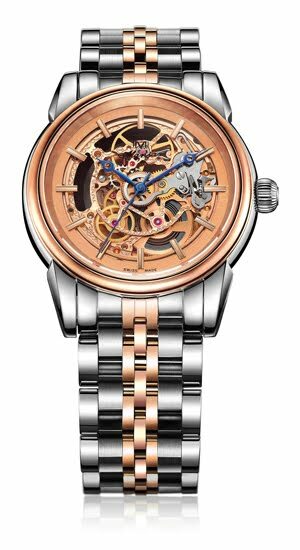 The finely crafted and openworked movement makes a perfect match with the pink or yellow gold colours of the bezel, a characteristic typical of the first watch models. By way of contrast, the blued hands radiate a distinctly contemporary appearance. The two-tone bracelet reinforces the vintage effect. Each model is numbered on its caseback and delivered in a luxurious wooden presentation box.